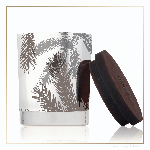 Thymes Frasier Fir Statement Collection Pine Needle Candle creates an inviting environment where ever it’s presented. With metallic silver and real wood accents and the aromatic snap of Siberian Fir needles, heartening cedarwood and earthy sandalwood, Thymes Frasier Fir Statement Collection Small Candle sets the mood. art of the Thymes PLANT ONE TREE Program.